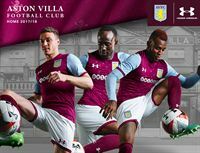 Unibet, part of Kindred Group, has become the Principal Partner of Aston Villa Football Club. Unibet, part of Kindred Group (prev. Unibet Group) will become the Club’s official shirt partner from the start of the 2017-18 season, which will place the Unibet brand at the heart of English football with the biggest club in England’s second city. The Unibet brand will be on the front of The Villan’s and the Aston Villa Ladies’ team shirts. Unibet are currently offering Aston Villa as their 8/1 joint-favourites to win The Championship this season whilst Steve Bruce’s men are also considered the most likely to gain promotion back into the top tier at 5/2. Kindred Group is listed on Nasdaq Stockholm Large Cap, and is one of Europe’s largest online gambling operators. Kindred Group is home to 11 brands, which serve over 16.9 million customers worldwide. Kindred Group is a member of the European Gaming and Betting Association (EGBA) and founding member of ESSA (sports betting integrity). Kindred Group is audited and certified by eCOGRA for compliance with the 2014 EU Recommendation on Consumer Protection and Responsible Gambling (2014/478/EU). Read more on www.kindredgroup.com.